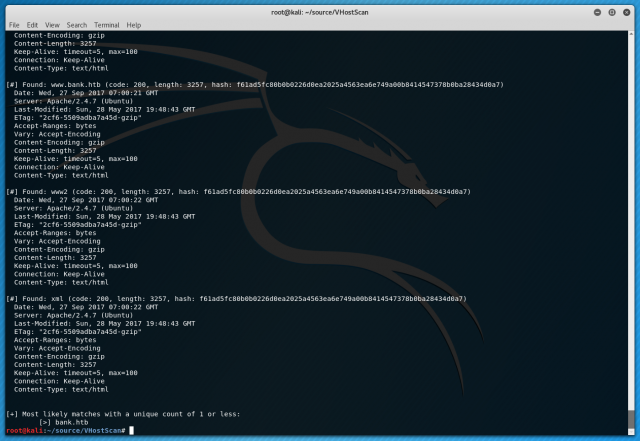 VHostScan is a Python-based virtual host scanner that can be used with pivot tools, detect catch-all scenarios, aliases and dynamic default pages. -h, --help	Display help message and exit -t TARGET_HOSTS	Set the target host. -b BASE_HOST	Set host to be used during substitution in wordlist (default to TARGET). -w WORDLISTS	Set the wordlist(s) to use. You may specify multiple wordlists in comma delimited format (e.g. -w "./wordlists/simple.txt, ./wordlists/hackthebox.txt" (default ./wordlists/virtual-host-scanning.txt). -p PORT	Set the port to use (default 80). -r REAL_PORT	The real port of the web server to use in headers when not 80 (see RFC2616 14.23), useful when pivoting through ssh/nc etc (default to PORT). --ignore-http-codes IGNORE_HTTP_CODES	Comma-separated list of HTTP codes to ignore with virtual host scans (default 404). --ignore-content-length IGNORE_CONTENT_LENGTH	Ignore content lengths of specified amount. --unique-depth UNIQUE_DEPTH	Show likely matches of page content that is found x times (default 1). --ssl	If set then connections will be made over HTTPS instead of HTTP. --fuzzy-logic	If set then all unique content replies are compared and a similarity ratio is given for each pair. This helps to isolate vhosts in situations where a default page isn't static (such as having the time on it). --no-lookups	Disbale reverse lookups (identifies new targets and append to wordlist, on by default). --rate-limit	Amount of time in seconds to delay between each scan (default 0). --random-agent	If set, each scan will use a random user-agent from a predefined list. --user-agent	Specify a user agent to use for scans. --waf	If set then simple WAF bypass headers will be sent. -oN OUTPUT_NORMAL	Normal output printed to a file when the -oN option is specified with a filename argument. -oJ OUTPUT_JSON	JSON output printed to a file when the -oJ option is specified with a filename argument. -	By passing a blank '-' you tell VHostScan to expect input from stdin (pipe). -t TARGET_HOSTS	Set the target host. -b BASE_HOST	Set host to be used during substitution in wordlist (default to TARGET). -w WORDLISTS	Set the wordlist(s) to use. You may specify multiple wordlists in comma delimited format (e.g. -w "./wordlists/simple.txt, ./wordlists/hackthebox.txt" (default ./wordlists/virtual-host-scanning.txt). -p PORT	Set the port to use (default 80). -r REAL_PORT	The real port of the web server to use in headers when not 80 (see RFC2616 14.23), useful when pivoting through ssh/nc etc (default to PORT). --ignore-http-codes IGNORE_HTTP_CODES	Comma-separated list of HTTP codes to ignore with virtual host scans (default 404). --ignore-content-length IGNORE_CONTENT_LENGTH	Ignore content lengths of specified amount. --unique-depth UNIQUE_DEPTH	Show likely matches of page content that is found x times (default 1). --ssl	If set then connections will be made over HTTPS instead of HTTP. --fuzzy-logic	If set then all unique content replies are compared and a similarity ratio is given for each pair. This helps to isolate vhosts in situations where a default page isn't static (such as having the time on it). --no-lookups	Disbale reverse lookups (identifies new targets and append to wordlist, on by default). --rate-limit	Amount of time in seconds to delay between each scan (default 0). --random-agent	If set, each scan will use a random user-agent from a predefined list. --user-agent	Specify a user agent to use for scans. --waf	If set then simple WAF bypass headers will be sent. -oN OUTPUT_NORMAL	Normal output printed to a file when the -oN option is specified with a filename argument. -oJ OUTPUT_JSON	JSON output printed to a file when the -oJ option is specified with a filename argument. -	By passing a blank '-' you tell VHostScan to expect input from stdin (pipe). Another similar tool would be hostmap 0.2 – Automatic Hostname & Virtual Hosts Discovery Tool.